can we discuss calvin klein for a moment? i feel like francisco costa is secretly putting out some of the odd/coolest stuff at NYFW and no one is really getting into it! is it because it's a mega brand? i mean, those paperlike origami coats n dresses last season were sort of breathtaking and crazy...i feel like we should all be lusting after this stuff more! 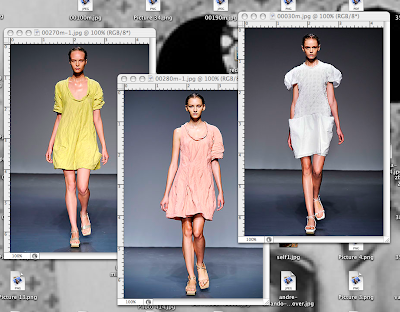 i was very lucky to go to the calvin klein S/S 2010 show and i have to say, it was really beautiful. all the girls looked like they had been caught in the rain, drenchy lowponytails and slick skin but it was so pretty? you have to trust me, they were so pretty and weird and COVETABLE. i never go for a one-sleeve situation but these were so cool. the first section of all whites and the last sections pastels were my favorite. the white patent leather is SO MINE. 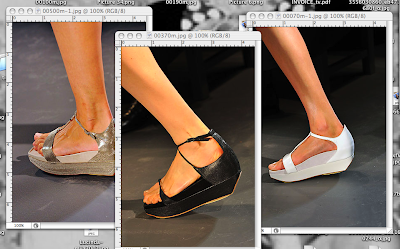 they are reminding me of the Sassy magazine editor craze of the mid-90s when they all took their birkenstocks to st mark's and got mega platforms put on them*. i may need to recreate this this winter, who's with me? yup, totes noticed these sandals too...calvin's shoes aren't too too pricey right? PLATFORM BIRKENSTOCKS? Well I never. yes, yyyyes! love those shoes. yes please. in LA we need wedges all year round. obv.